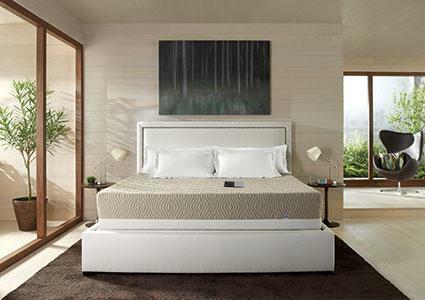 Though there are several air beds on the market, Sleep Number® beds are the only ones to feature DualAir™ technology. This allows for an individualized level of firmness on either side of the bed. Each bed will need a modular base (cost about $300 for a standard queen size) or an adjustable FlexFit base (cost about $1,200 for queen size). Having the proper base will ensure the mattress is covered by the 25-year warranty. Customers also receive a 100-day in home trial, during which time the bed can be returned for a refund if they aren't satisfied. Sleep Number beds come in a variety of styles and prices, ranging from approximately $500 to $5,000. Sleep Number offers three classic beds, each featuring an inch of soft foam, quilted into the fabric covering of the mattress. This layer also includes antimicrobial protection. The primary difference between the three is depth and plushness. The c2 is 8 inches thick, and a queen-size set sells for about $800 at its regular price. The king-size is priced at about $1,300, a double size costs about $700, and twin size is about $500. The c4 is 10 inches thick with a plusher layer of 1½ inch foam. The queen-size set sells for about $1,500. The king set costs around $2,000, the double is around $1,500, and twin size is about $1,300. The CSE has a 10-inch profile with 2-inch foam layer and the queen set is priced at about $1,800. The king size is priced at about $2,300, a double size is around $1,725 and twin size is about $1,500. The Performance Series kicks comfort up a notch. It contains the features of the Classic series, plus a pillow-top, a knit fabric that wicks moisture away from the body with even more plushness. The p5 is 11 inches deep, with a 2-inch comfort level. The queen size set sells for around $2,000. The king size set costs around $2,500, the double size is about $2,000, and the twin size is about $1,500. The p6 is 12 inches deep, with a 3-inch comfort level, and features enhanced breathability. The queen size set sells for around $2,500. The king size set is priced at about $3,100 and twin size is about $2,150. There is no double size available. In this category, there is one option available that adds a layer of memory foam to the equation, as well as additional enhancements. The m7 is 12 inches deep and includes 3-inches of exclusive CoolFit™ foam with gel technology. The queen size set sells for about $3,500. The king size is priced at about $4,200, the double is about $3,075, and the twin size is about $2,800. The Innovation Series helps to minimize body temperature swings. It absorbs heat and releases it to keep you cool. There are three options available. The i8 is 13 inches deep, with a duvet style pillow-top, and 3 inches of PlushFit™ foam. The queen size set sells for about $3,500. The king size set is priced at about $4,200, the double is priced at about $3,100 and the twin set is around $2,800. The i10 has a 15-inch profile with the same temperature balancing technology, and the queen set sells for about $5,000. The king size set is about $5,700, and the twin and double are not available is this selection. The iLE has a 14-inch profile with 3 inches of comfort layer, and the queen size set is priced at about $4,900. The king size set costs around $5,600, the double is priced around $4,425 and the twin set is about $4,150. The only way to know for sure which model is best for you and your budget is to visit a store and try them out. Compare the different models and features that suit your needs. One new feature that is available is called Sleep IQ Technology, which tracks how well you sleep each night and gives you a sleep score. This nightly feedback can be helpful to make adjustments to your sleep pattern. The sleep sensor can be added to the mattress for about $200, so there is nothing to wear or turn on. Sleep Number frequently offers deep discounts during seasonal sales that can save you several hundred dollars. Be sure to check that the discounted mattress is eligible for the same warranty as full priced beds. Before you go shopping, check out the sale prices and ask about arrangements for financing.There is also a factory outlet, which offers beds that are sold at closeout prices. These discounts may be due to design changes or style updates, but they still have the same dual chamber technology.